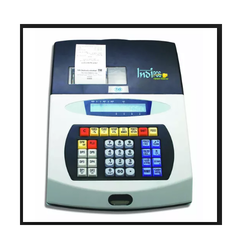 Our range of products include cash register. Paper width 6", Greater than 8", 8", 4", 3"
Our company manufactures (PT-262) Cash Register which does non-stop billing. It prints your bill with your brand logo and this is its specialty. This has a printer which is in built and prints faster than any other printer of about 20 times. It prints 50mm per second. It has a display of 6 8 Alpha numeric LCD display and a customer display. It also has RS232 for the Barcode, PS2 for Barcode and also drawer. It gives Stock Management, Duplicate Bill, Price, VIP price, Cashier, Clerk Name on Bill, RA&PO Function, Refund, Surcharge, Separate Keys for Discount, Price, Mark up, etc. Delight your customer - Print your customer name on each bill!! Shake your hands - Easy integration to External Printer, Weighing Scale, Barcode Scanner and Cash Drawer, all at the SAME time! Looking for Cash Register ?